As you can see (hopefully!) I've redecorated my blog. It was time for a change since the old header had a photo of Nolan when he wasn't even a year old. It has been so long since I tinkered with the design aspect of Typepad that I was completely lost and it took me far longer to achieve this than I had though it should. I am also sure they have changed many things behind the scenes... so I was learning things for a second time, love that. Everything is working on my end, the header isn't cut off, i can read all the words in the side bar... can you find anything I missed? Please let me know, I appreciate it. I plan on changing the design more often now that I have a lot of time on my hands, summer holidays and all... it should be fun. Speaking of summer holidays, Paige was invited to her new school this week for a grade one orientation! It's a full day that involves lunch and the whole kit and caboodle! She's really excited about it, and so am I. She's met more people in this town than I have just by trolling the neighborhood and playing in the park across the street. It doesn't matter where we are in town, she sees someone she's met at the park. My little social butterfly. Nolan is, well, Nolan. We've finally managed to get him to go to the toilet alone without dragging someone along for support (by 'someone' I mean ME). Which was great this week because he discovered my 1litre water bottle and was literally going ever couple of minutes. Suffice it to say he and the water bottle have parted ways permanently. Ken is finally finished his shut down. For those of you who don't know what i mean by 'shut down', it's when they Shut the whole plant down and perform repairs on the place that they couldn't do while everything is up-and-running. Everybody works and they work every day until it's done This also means, in wife speak, "You won't see your husband for several weeks, and when you do he'll be very tired and perhaps a little grumpy.". We all love him so much we can handle a little grumpy. We are just waiting for him to get off his normal shift now so we can hang out and do some things together. Camping on the list of things we want to do, the tent has been purchased and we are just waiting for some free time. I'm really interested to see how the kids handle camping now that they are older. Shoot, I'm interested to see how I handle camping now that I'm getting older. As for me, not much new. I'm spending my days keeping the kids busy. They play outside most of the time but everytime they come in the house they seem to create an hours worth of 'damage control' for me. I don't need to tell you that they are in and out of the house several times an hour. I'll have to admit that this last month has really drained me. Like I said in the last paragraph, we really need our Kenny home. Sunny Days and air conditioned nights. We haven't been experiencing a whole lot of sunny days since we've arrived in Strathmore, but the few we've been graced with have been scorching hot. Rumours of a hot sultry summer have been coming down the pipe from my mom so the Mr. and myself figured a purchase of a new air conditioner was in order. We purchased a mobile unit that sits inside your room and vents through a variety of different sized window openings. We fired it up last night, even though it wasn't really that hot, it was nice to take it for a test drive. Just as you expect, I gave it both thumbs up. It was much quieter than our other window mounted unit (keeping in mind that our old unit was 4 years old!) and you can set the exact temperature that you want the room to be at, which is nice. Our old unit had three settings, fan, arctic, and antarctic. We spent three times more on the mobile unit but it was the best option while we are renting. After experiencing the last 4 summers sleeping through air conditioned nights, I don't think I could ever go back. As a matter of fact, I'm thinking of hauling the thing to my Parent's house when we visit during the summer.... or just get them to buy one!! We spent father's Day weekend in Leduc at my parent's place. It was a nice visit even though my kids seemed to become hard of hearing shortly after our arrival. I had a nice day shopping with my sister (which we should do again soon!) and on Father's day I had a great visit with my good friends the 'Franzman' family. They hadn't seen me since paige was 4 months old!! If my Dad and Ken had been there for Father's day it would have been perfect, but both of them are working shut downs at their respective plants. We were home in time to see Ken on Father's day so that was nice. The kids presented him with cards and the gift of shaving gear. Paige wanted to pick out and outfit for her dad but considering her fashion sense and stubborn streak, I though shaving gear was a safer bet. Nolan picked out a talking Elvis birthday card for Ken and I put it back but in retrospect I should have bought it Ken's birthday was on that friday... duh. For those of you that are wondering (and for those of you who aren't), I got my LIME!! Ken ordered it for me so it's not in yet but I'm looking forward to getting it sometime early next week. I had to settle for the baby blue one, but I don't mind one bit. I'll keep you updated on this one. Today is recycling day. I have been trying to save all of our recycling in a large plastic tote in our half bath, it's been overflowing for a couple weeks now. This town doesn't have a door to door recycling program but they do have a large facility here in town. So today I'm taking the kids and we are going to sort and off load this stuff!! Ken and I have decided that we are going to take up a hobby. One that we can do as a family and be active at the same time. Bicycling seems to fit the bill. Now that we live in a town without any drastic changes in elevation, riding a bike seems like something I would like to get back into. Ken has been talking about the bikes they use at work to get around the plant site. They are Cruisers (sometimes beach cruisers) and he said he loves to ride them. On his only day off, He bought one from Canadian tire and took it for a whirl but he found it wasn't as nicely designed as the cruisers at work and he felt cramped. I got more details from him and found the bikes they use are a brand called Trek. While perusing the site I came across the bike you see above, it's a line of Trek bicycles called "Lime". After reading about it and looking at it, I was hooked. The design is just so ME. The one featured in the photo above is the Ladies model in green (of course!). It's been YEARS since I have had my very own bike, and now I find it strange to be so excited about riding one again! Kind of like being young again, not that I'm old, but it's been that long since I had my own bike. Ken and I had bikes before we were married and used to go out quite often for rides. When we moved to Nanaimo, my rides stopped immediately after my first hellish, and very 'hilly' ride. Time to get back on the horse. So of course, I have expensive tastes and this bike is 4 times the price of any of the other bikes i could have chosen. So I don't know when I will be getting it- but eventually the universe will bring it my way. And when it does, I'll take photos. p.s. And the rain will have to stop soon, or I'll have to spend my money on scuba gear (or perhaps an ark) and not a bike. The Weather can smarten up ANYTIME! 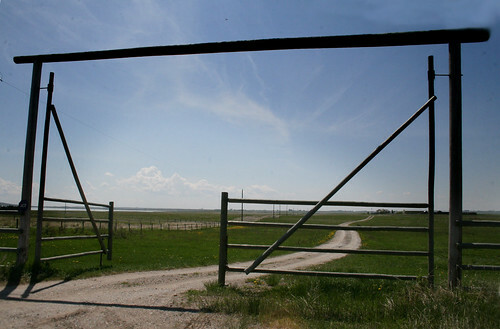 the Encana Farm, originally uploaded by island artist. Having the kids around the house is starting to loose it's luster real quick (Did it ever have a luster??). Since Mr. Sunshine has decided to go on holiday, the kids have been driving me crazy! The new park across the street has been completed but every time we go over there to play it starts POURING rain. For me, it's feeling like winter, a Vancouver Island winter!! ugh. On my Mac weather forecast it says we'll have sun on thursday and more thundershowers after that with partial sun. Boo. We are planning on going to Leduc to visit my family on the 12th or 13th which I feel a little bad about because the13th is Ken's birthday! He didn't seem too bothered by it as he is working every day for the next month. I was thinking that perhaps a break from the kids waking him up at night may be in order. We will also be missing Father's day with Ken but I'm thinking we'll move that occasion to July when he's not working every day and we can all do something together. My mom has taken Piper for us until we finally buy a home. I sure miss my furry mutt! I'm glad to hear from my Mom that she's been on her best behavior and not fighting with Sadie (my mom's dog). I have heard that she's been eating Sadie's food but I don't think that's out of mean-ness, more out of Gluttony. She is MY dog after-all. Can't wait to see her when we go out to visit. Well, I should hop a long, the kids have lost my only set of car keys under the front step and claim they can't reach them. 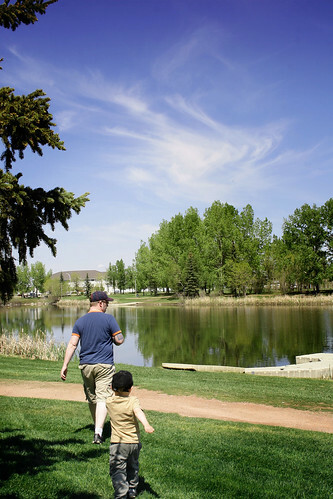 Kinsmen Park, downtown Strathmore, originally uploaded by island artist. Hello again my friends. Well, we've been in Strathmore for a little over a week now and things are starting to return to a state of normalcy. We checked out the downtown area and took the kids to see the new Indiana Jones movie in the local theatre. It shows one movie, once a day at 8 (be there or be square). Despite the lack of cup holders, the seats were VERY plush! Even though I was expecting a gong show because of Nolan's short attention span, he was very well behaved! One afternoon we walked around the lake downtown which is part of the Kinsmen park (i'm sure the lake had a name but I missed it!). The kids played in the playground and Ken and I watched on from a shaded bench. It was a nice afternoon. The kids have been playing with some other kids they met in the neighborhood, it didn't take long for that to happen! Having them playing outside has left me some time to straighten out the house a little each day. I could be done by now but I am taking it easy and spreading out the 'love', if you know what I'm saying. Not to mention, in this place, the laundry facilities are in the basement. Now, I can fully appreciate how nice it was to have my laundry facilities upstairs, next to the bedrooms!! Oh well, I can use the exercise and I should be thankful for having laundry facilities in the first place... and brand new ones at that! My sister has be started on her eating plan. I can't say it's been easy going. I've been acting out like a smoker trying to quit cold turkey. But I'm going to try my best anyway. It's nice that my sister is here to support me on this. Lord knows, I need support! Well, I should go, I've got a bit of energy and a lot of things I want to get done today... so I had better get to it!